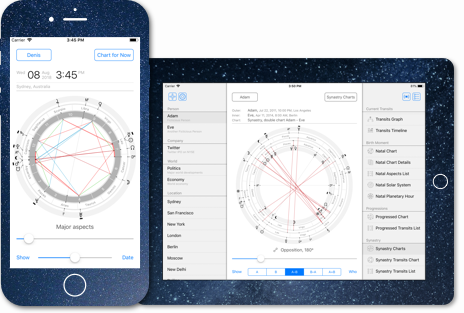 Real-time astrological charts and transits explorer application. Explore astrology and astronomy in clarity and style. Track transits in real time. See upcoming changes. “ Time Nomad combines essential sets of astrological charts with attractive graphic displays and cutting-edge discoveries, including transit charts, progressed charts, synastry charts, composite charts, planetary hours, aspectarians; tropical and sidereal options, minor bodies such as asteroids, Chiron, Kuiper Belt objects; and illuminating points such as the lunar nodes, vertex, and Part of Fortune. Why Time Nomad is so convenient? Time Nomad was created with the intention to give you a tool that would enable you to better understand the dynamics of celestial bodies and their corresponding astrological meaning and interpretation. The app is a perfect companion for astrologers of any level — from a student who is beginning to learn astrology to a professional astrologer offering clients’ charts reading and using prediction techiniques. Time Nomad keeps you in touch with ever changing configuration of planets, minor bodies and asteriods. It’s a modern astrological tool designed to be in your pocket and give you answers in real time. Astronomical and astrological information is presented in unadorned, concise yet expressive manner to help you see the bigger picture. Time Nomad comes with useful iOS event notifications that notify about upcoming events — in advance — aspects, transits, solar and lunar returns, phases of the Moon and Moon Void of Course. The app supports both tropical and sidereal Zodiac. The sidereal Zodiac reporting comes with a variety of ayanamsa. Thank you for the work you do that allows us all to stay informed of the changes above while mobile. There’s nothing like this app, or rather, no other that compares. I adore this app, and it is by far the best phone astrology app I have found. one thing I would love to see is possibly a place to make notes on a chart, and also the ability to add more asteroids (I love asteroids). But overall, amazing. This app is extremely powerful and enlightening. So many features included for free and so well designed and executed. Thank you. Time Nomad is an advanced planetary positions calculator software that ensures accurate birth chart calculations. The app can also build precise astrological charts for any given date within nearest centuries. Time Nomad uses accurate DE-430 ephemeris to calculate positions of all major and minor planets, including asteroids. Time Nomad not only precise, it is incredibly fast too. Astrological calculations perform instantly and do not require your device to be online — once you’ve created profiles, Time Nomad doesn’t require you to be online at all, all astrological calculations always performed on your device. You can literally use Time Nomad in a desert without any internet connection. Astrological charts support any geographic location on planet Earth. Learn more about how to build natal charts using Time Nomad. Time Nomad software is unique in its ability to calculate both tropical and sidereal zodiac systems using high precision ephemeris. You can freely switch between the two models of the Zodiac, pretty much every report offers both tropical and sidereal zodiac versions. Time Nomad calculates your astrological transits, phases of the Sun and the Moon, movement of planets through the Zodiac, retrograde planets, Moon Void of Course, solar return, lunar returns, lunar month, solar-lunar arc, parallels and contra-parallels, etc. For advanced astrological analysis, Time Nomad offers synastry and composite chart calculators as well as progressed chart calculator. Time Nomad makes it easy to find out exact moments of aspects, transits and a number of other astrological and astronomical events. For each event, the app provides two charts: a regular chart and a chart of transits for the easy analysis of astrological transits happening at that exact moment in time. Learn more about how to calculate astrological events like aspects, transits and retrogrades using Time Nomad. Time Nomad offers fixed stars calculations for both tropical and sidereal Zodiac systems. Fixed stars calculator comes with an extensive list of 107 stars and stellar objects that are of the most importance for astrological chart interpretation. The list of fixed stars includes fifteen Behenian stars, major galaxies, stellar clusters and nebulae as well as other stars with major astrological influence. Both natal and regular charts include visual positions of the fixed stars including their aspects to the planets and all other major point of the chart. Calculations of astrological aspects to the fixed stars are not limited to conjunctions, the user is free to search for other aspects, both major and minor. The user if free to customise the aspects orbs to desired values. Learn more about how to work with the fixed stars using Time Nomad. Summary of upcoming astrological events is presented in both textual and timeline formats. The app uses system notifications to send you daily updates about your transits and astrological events that are about to happen. The app comes with a planetary hours calculator, planetary hours alarm and other tools to work with planetary days of the week. Learn more about how to work with planetary hours using Time Nomad. You can create an unlimited amount of personal astrological profiles. All data belongs to you and stored on your iCloud account. No login or registration required. With Time Nomad you can analyse any number of natal charts — for yourself and other people. You can use Time Nomad to better understand astrology and answer the question “what is astrology” thus learning how to become a professional astrologer, with time. The Time Nomad blog is a virtual astrology training for those who are interested in astrological studies or simply curious about how and why astrology works. Time Nomad will provide you with regular weekly astrology lessons and predictions. The app will be your virtual astrology teacher for years to come. Subscribe to a regular newsletter covering topics of astrological knowledge and current astrological events.